More progress, new photos I have received new photos from my customers and have posted some on the photo set at Flickr. 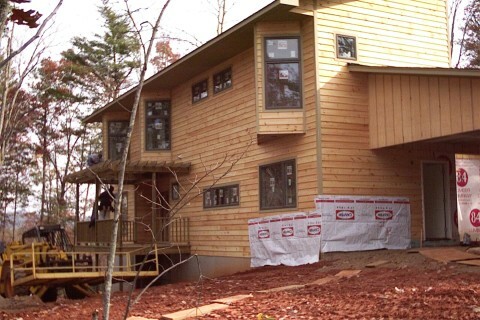 The house is fully sided and most of the exterior work looks complete. Inside all the drywall work looks done, and wood trim underway. They say they will be in the house in January. One thing I have not discussed relative to this instance of the Tray House is deviations from the plans. These things are immediately obvious to me, and I assume the design savvy readers here will also take note of these things. Deviations are going to be par for the course with stock plans and I don't really regard them with any criticism. I think it is valuable to consider the fall out of these changes however as they can have a ripple effect. If you think these things through you will know better how they affect other parts of the design. Sometimes these issues are purely technical, and sometimes aesthetic, but they tend to get tangled together. For example the builder of this house used roof trusses rather than roof rafters to frame the roof. That in of itself would not necessarily cause other changes, but somewhere in the process a decision was made to support the trusses that were above the bay windows on a header above the window rather than a beam spanning the entire bay window opening at the wall as specified. What this did was create a variety of span points in the trusses which I am guessing make it easier to make the trusses with the bottom cord extending all the way out under the eave. This created a horizontal eave where the design called for an eave that followed the roof slope. It also required headers to carry the roof load above the bay window units which now had to be pushed downward, almost to the floor to make room for them. Small decisions can propagate little changes in this way. We can always help you to think them through so you are satisfied with changes that may result.